The Dyson DC16 Root 6 hand-held vacuum cleaner remains one of my favorite toys. It only does one thing, but it does it really, really well. It also looks like a prop from a low-budget flick on the SciFi Channel, which is unquestionably a bonus. As with all hand-held appliances, the Root 6 is powered by a battery… and its battery is easily its most contentious element. Despite being quite large and way heavier than the rest of the device, it can only run the beast for a few minutes before it’s exhausted, and it thereupon requires several hours in its charger to get its mojo back. In that the Dyson Root 6 is intended for occasional inhalations of dust bunnies and other desk fluff – rather than vacuuming your entire digs – its fleeting battery life really shouldn’t be a serious issue. This said, the times that the battery in our Root 6 has snuffed it with mere seconds of work left before it are without counting. A more nettlesome aspect of the Root 6’s battery is what happens when it approaches its dotage, and wants replacing. While the Dyson Root 6 itself seems to be available at practically every retail establishment with a credit card machine, as nearly as we could determine, replacement batteries for this device can only be ordered from Dyson. The cost of a new battery and the charges to ship it will beat up your plastic for about two thirds the cost of a new vacuum cleaner. Furthermore, having paid off the Grendel and returned your Root 6 to health, it will still be powered by a somewhat ephemeral battery with an abbreviated working life between charges. The Root 6 vacuum cleaner fairly shrieks for an aftermarket replacement battery – and perhaps not surprisingly, one has appeared. 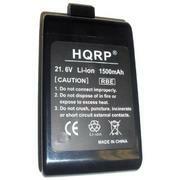 The Osprey-Talon HQRP battery is compatible with Dyson’s Root 6 and Animal hand-held vacuum cleaners. It’s sold through Amazon, wherein it cost $56.95 as of this writing, and it shipped for free. It delivers 1500 milliamp / hours, as opposed to the 1080 milliamp / hours afforded by a genuine Dyson replacement battery. It’s also black rather than gray, which makes the Root 6 look a bit sportier and slightly sinister. The extra life of the Osprey-Talon battery transforms the Root 6 vacuum cleaner. It just seems to run forever on a charge. More to the point, unless you’re habitually untidy or you own a dog even larger than ours, you’ll run out of dust bunnies before it runs out of lightning. Perhaps predictably, the HQRP battery works flawlessly. It fits the Root 6’s battery chamber exactly, and after an initial charge it boots right up and rocks. The vacuum cleaner’s logic clearly doesn’t know it’s dealing with an alien life form. As an aside, it’s arguably worth mentioning that when you change the battery in a Dyson Root 6, you should probably check out its internal filters as well. The most contentious of these is a blue plastic structure that resides in front of its motor. The filter includes a small magnet, which rests upon a device called a Hall sensor. If the filter becomes clogged, such that its wind resistance increases, the magnet will pull away from the Hall sensor, and the vacuum cleaner will go into a coma. While it’s easy to remove fibers and other large detritus from the surface of the filter, it’s usually less obvious that the internal fabric of the filter can become clogged with small dust particles. You can clean the filter entirely with an air compressor. If the Root 6’s filter isn’t kept fairly clean, it will cause the vacuum cleaner to behave as if its battery is dying. Afterword: Several weeks after installing the Osprey-Talon HQRP battery in our Root 6, our Root 6 emitted a very loud bang, and a lot of blue smoke. It’s looking decidedly like e-waste. I’m disinclined to blame the battery for it’s demise – as nearly as we were able to determine, the Osprey-Talon battery produces the same voltage as a genuine Dyson battery, and it doesn’t appear to be capable of actually damaging the vacuum. It looks like our Root 6 finally realized it was off warranty, and it leapt off a cliff. I can’t help but wish it had chosen to do so before we sprung for a replacement battery. Dyson informed us that repairing the Root 6 would cost about a hundred dollars. The current replacement for the Root 6, the DC 30, costs about two hundred dollars… both options constituting a serious bite for nuking dust bunnies. As cool as it was to use, the Root 6 died awfully young. It was ultimately replaced by a DeWalt DC515K.